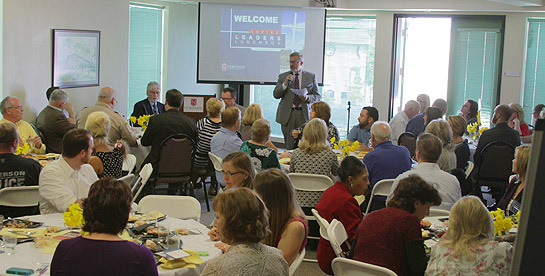 REDDING, Calif. - More than 90 guests attended a sold-out ASPIRE Leaders Luncheon on March 19 hosted by the Simpson University School of Adult Studies and the Alumni Office. The luncheon included ASPIRE alumni and students, as well as Redding community leaders, law enforcement, business owners, former ASPIRE deans, ASPIRE faculty, and others. Dr. Baron talked to audience members about how to lead for the sake of others, challenging them to develop good community and practice integrity. He noted that the most important thing he does as a leader is “to become a bearer of hope,” encouraging, inspiring and equipping others. The School of Adult Studies (ASPIRE program) has graduated nearly 3,500 North State adults during the past 25 years. It offers bachelor’s degrees in business management, liberal studies, psychology, and organizational leadership, with online and weeknight on-campus class options. Dr. John Burlison, dean of adult studies and online programs, said he was pleased with the event, which he hopes will become annual. “The focus of future Leaders Luncheons will be professional development and networking with local business leaders,” he said. 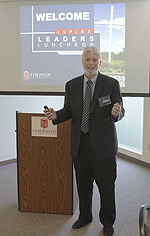 For more information on ASPIRE, visit simpsonu.edu/aspire.